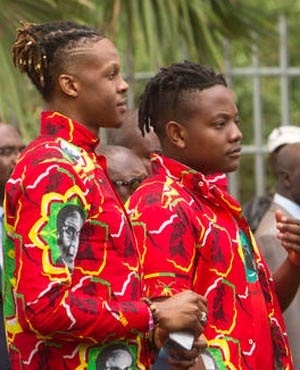 President Robert Mugabe's sons were evicted from a luxury apartment block in Johannesburg’s affluent Sandton area because of their "unacceptable behaviour"
The two boys – Robert Junior and Chatunga Bellarmine - had been renting a luxury apartment at The Regent apartment hotel, in Morningside, Sandton. Apartments at the building are rented out for up to R74 000 per month, sources said. "The boys were usually up during the night partying with different ladies, drinking and smoking," one unnamed resident told the paper. "There were almost daily complaints by other tenants about the noise coming from apartment 601 (the Mugabes' apartment)." Things came to a head late last month after "a violent brawl" in the complex's entrance area left a member of the boys' security team seriously injured. The fight was said to have involved "a dispute over women". The boys were forced to vacate the property after that incident, other soutrces reported. Mugabe's sons relocated to South Africa from Harare and Dubai earlier this year.